Blue jam – Soundtrack for a mental breakdown. If you’ve been itching to put yourself inside the mind of someone on the verge of mental collapse then may I suggest listening to Blue Jam. 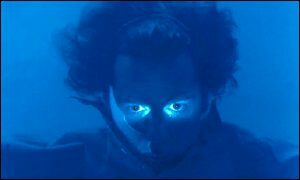 From the frightening neon nightmare mind of Chris Morris Blue Jam is lunacy…compelling, fascinating lunacy. It featured the vocal talents of Kevin Eldon, Julia Davis, Mark Heap, David Cann and Amelia Bullmore. Chris Morris reads the deranged monologues. I’m coming to the radio show quite late; having watched “Jam” the TV version many years before. I’m happy to see that the madness translates just as well over the audio spectrum as it did the visual. It’s worth digging up just to see what I’m talking about. Can I give you a reference to any particular part that was of note? Not with any confidence I can’t, as you see I’m no longer sure what is the show…and what is my mind.